First there was the victory of a nearly overwhelming “no” vote of Greek voters against the demands of European capital. They showed they were not cowed by all the threats and intimidation, nor by the financial crisis first set in motion by the major capitalists taking their money out of the country. They showed they were willing to fight against more cuts, more unemployment, more poverty. Then, less than 24 hours later, Greek Finance Minister Yanis Varoufakis resigned. In his resignation statement, he strongly implies that he has resigned at the request of Greek Prime Minister Tsipras. A Wall St. Journal report says this directly. 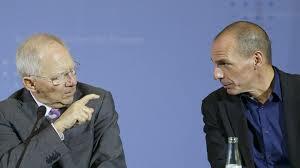 Yanis Varoufakis (r) and his former counterpart, German Finance Minister Schauble. No love lost between these two. According to other reports, Varoufakis represented the “left” wing of the Tsipras administration, while his deputy prime minister represented the more conservative wing, and that Tsipras was vacillating back and forth between these two. With the forced resignation of Varoufakis, it seems Tsipras is moving more decisively in the direction of the more conservative wing. According to these same reports, many of the other representatives of European capital had a strong personal dislike for Varoufakis and saw him as being in the way of a deal. Maybe he was, but even he never really advocated mobilizing the power of the Greek workers and linking that up with the workers throughout Europe. We are getting reports of overwhelming enthusiasm, maybe even euphoria, in Greece following the “no” vote. Those feelings are understandable and positive, but we also have to look beyond that. We have to try to analyze what are the plans of both the “partners” as well as of Tsipras. One of the three “partners” – the International Monetary Fund (IMF) – has concluded that the kind of harsh “austerity” that has been imposed on Greece does not work. They see that all it does is reduce demand even further, leading to even worse recessions. The other two “partners” – the European Commission and the European Central Bank – seem hell-bent on continuing to punish Greece. From the outside, it seems likely that the IMF is more concerned with global economic and monetary stability, while the other two “partners” are more concerned with being sure that Spain doesn’t go down the Greek road, that the Spanish workers see their Greek counterparts punished sufficiently so that they are intimidated. So what might come out of this? Maybe Tsipras is hoping that with Varoufakis out of the way, he can get the “partners” to make a few very minor concessions. 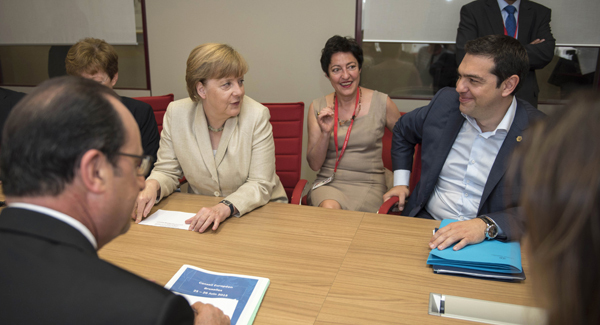 Tsipras meeting with shark-in-chief Merkel. Can they make a deal? Then he can come back to the Greek people claiming a big victory. Here in the US, we’ve seen that time and again with union negotiations. The employers make really disastrous demands. The union leaders holler and scream blood murder, all the while refusing to really organize to fight. Then, at the 11 and 1/2 hour, the employers make some very minor concessions and the union leaders come back to the members waving a deal around, claiming a huge victory. Everybody (or almost everybody) is very happy… until some months later when the reality of what happened confronts them.